There is no mystery as to why a man who revolutionized the game of basketball is so underrated. It is because Paul Arizin is, quite simply, a man without a team. While Wilt would make a triumphant return as a Sixer after the Warriors moved, Arizin never got the chance, so his records are kept in the city of Oakland, where he never played a game in his life. Furthermore, he is underrated there as well, simply because he never played there. While the jersey numbers of Tom Meschery (12.7 ppg, 8.6 rpg) and Al Attles (8.9 ppg, 3.5 rpg) hang in the rafters at Oracle Arena, Paul Arizin’s #11 is free to any player who wants to wear it, despite his 22.3 ppg and 8.6 rpg. Despite the fact that he has the 3rd most points and 5th most rebounds in franchise history and despite the fact that he was named one of the NBA’s 50 All-Time Greatest players in 1996**. He was the first pick in the NBA Draft in 1950. He lived up to the billing. He averaged 17.2 PPG and was named the NBA’s Rookie of the Year. The next year he led the league in scoring, at 25.4 a clip. But it wasn’t just his scoring that electrified the league…it was the way he did it. Other players had tried, but Arizin was the first bonafied superstar to make the primary weapon in his arsenal. Once Paul became one of the premiere players in the game, other players started emulating him, and by the end of his career, he had relegated the two handed set shot to the same dustbin that held the peach basket and the stitched basketball. Arizin took off two years to serve during the Korean War, and the Warriors went from contenders to the laughing stock of the league. 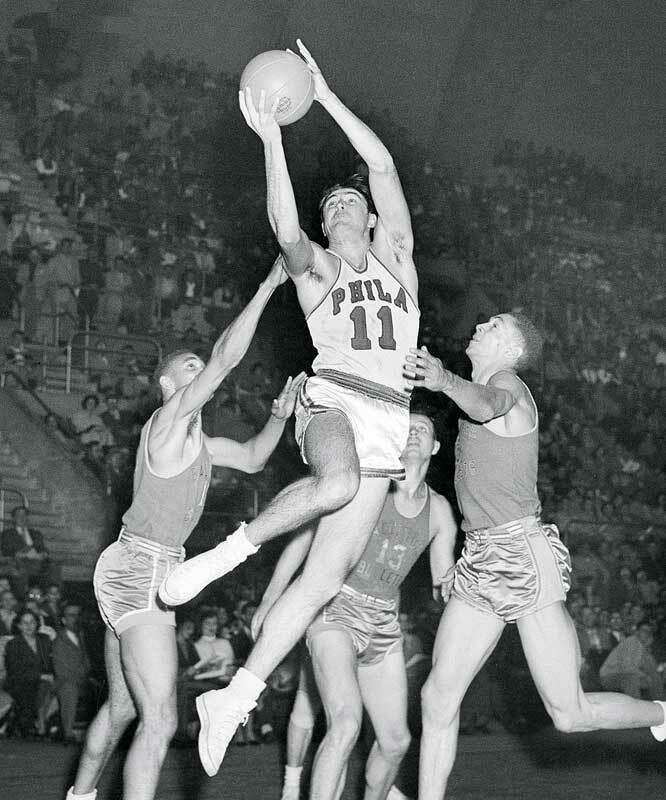 As soon as he returned, the team improved, and in 1955-56, they won the NBA title, led by Arizin’s 24 PPG and 7.5 RPG. He would maintain a high level throughout his career, averaging 21.9 points and 6.8 rebounds in 1961-62, the final year of his career. When the team decided to move to San Francisco, he decided not to make the trip, despite being the 2nd highest scorer on the team. The Philly native had been offered a job at IBM making more money than he was making in the NBA, and he decided to moonlight with a semi-pro team called the Camden Bullets. He remained in the area for the rest of his life, and passed away in 2006. 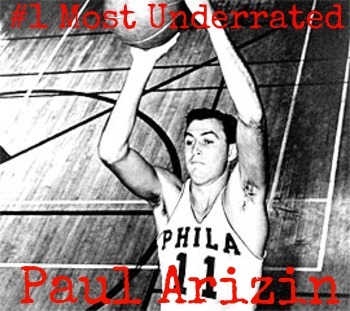 He gets to be number one on the list not only because he was one of the greatest basketball players in the history of the NBA, but because he revolutionized how the very sport was played. **He is one of only three in the Top 50 to not have their jersey retired. The other two were Dolph Schayes and John Lucas. Interestingly, the Sixers are in a very similar situation…Schayes played almost his whole career Syracuse as a National (the current Sixers). But since he only played one year in Philly, he has been ignored by Sixers brass. I’ll have another post on this soon.